Arenas, Elmwood Giants, Knights of Pythias, Thistles, Y.M.C.A. One of the early WCBL-to-the-majors graduates, 21 year old Jack Fournier of the 1911 Moose Jaw Robin Hoods was in the majors less than a year after his Western Canada League playing service. In 1911, Moose Jaw ran away with the pennant behind the batting of Fournier who led the league in just about every batting category including 149 hits, 106 runs, 28 doubles, and 19 triples. He was second in batting average with a .377 mark. One year later, he began a big league career in which he would post a .313 lifetime average over 15 seasons. He saw mostly limited action in his first 2 seasons with the Chicago White Sox but became a regular at first base in 1914, hitting .311. The next year he hit .322 and led the American League with a .491 slugging percentage in this dead-ball era. With the White Sox' acquisition of first baseman Chick Gandil in 1917, Fournier became expendable and he spent some mid-career time in the Pacific Coast League. Resurfacing in 1920 with the St. Louis Cardinals, he posted a .343 batting average in 1921. Traded to the Brooklyn Robins (pre Dodgers) in 1923, he went on to have his most productive years. His 27 home runs in 1924 paced the National League and, in 1925, he was second to Rogers Hornsby with 130 RBI. In 2001, in The New Bill James Historical Baseball Abstract, James had high praise for Fournier. Paul Krichell Talent Scout Award : Tom Meany wrote a book in 1949, Baseball's Greatest Teams, in which he wrote that "the key man on the 1917 White Sox was Arnold (Chick) Gandil, who two years later was to be the key man of the scandal . . . Be that as it may, it was Gandil who made the 1917 Sox." That is a terrific book, and I respect the fact that Meany was closer to the team than I am, writing about it thirty years later, as opposed to eighty years later. b) Defense at first base may have been dramatically more important at that time than it is now. But Fournier was an adequate first baseman, and one of the outstanding hitters of his generation. 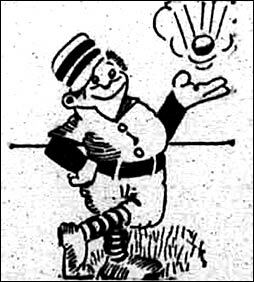 He hit .311 in 1914, .322 in 1915--with lots of walks, and with power. That was battling the dead baseballs. When the lively ball era arrived, and Fournier re-established himself in the majors, then he posted some real numbers. But he was just as good a hitter in Chicago as he would be in Brooklyn; it's just that the numbers don't look as good because in Chicago he was playing in a pitcher's park in a league with a 2.73 ERA. Fournier's 1914 season in Chicago, in context, was a tremendous season--28 Win Shares, by my math. A good many people have won MVP Awards with less. (b) engineered the fixing of the World Series. I don't know if honesty can be considered a talent, but that is one lousy exchange. Outfielder Jim Kelly (left) of the Moose Jaw Robin Hoods hit .332 in 1911 and after two more seasons in the minors debuted with the Pittsburgh Pirates in 1914. Cy Pieh (Edmonton and Brandon), who had seen time in Lethbridge in 1910, pitched his way into the majors in 1913 with the Yankees. Calgary outfielder Les "Tug" Wilson (right) was sold to the Boston Red Sox near the end of June and made his major league debut three weeks later. 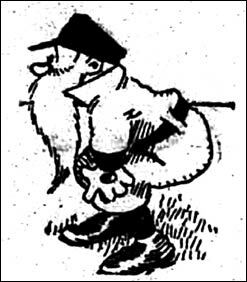 Bill Hunter of Brandon was up with Cleveland in 1912. Ray Brown of Moose Jaw and Tom Letcher, who split time between Brandon and Saskatoon, had seen big league action in previous seasons. Winnipeg pitcher Johnny Collins, one of the league's best hurlers in 1909 and 1910, was often identified as a college player. It was not until early 1911, however, that Collins was identified as Princeton University baseball and football star Logan Cunningham. He had been an athletic star in high school in Washington, D.C., before entering the New Jersey school. His exploits in Western Canada baseball earned him a contract with the Chicago White Sox, but it's believed he did not pursue a professional baseball career. He went on to coach college football at Princeton and North Carolina. Lieutenant Cunningham was seriously injured in an April, 1918 accident at Fort Sill, Oklahoma. Details were not released, but he was reported to have sustained a dislocated hip, two fractures of the left arm and a number of severe bruises in a 400-foot "aeroplane fall." The War Department did not provide any specific information about the mishap. His mother, Mrs. S.K. Cunningham said he had learned that her son was acting as an observer for artillery work when the accident occurred. It's believed Cunningham was one of the survivors of a train wreck in Pennsylvania in January, 1936. Three people were killed and 37 injured when the crack Reading Railroad express, the Williamsporter, was derailed as it approached the Susquehanna River Bridge. The locomotive jumped the tracks and plunged into the bed of an abandoned canal, sliding into the waters of the river. Cunningham, 48, suffered lacerations of the head and contusions of the head and back. 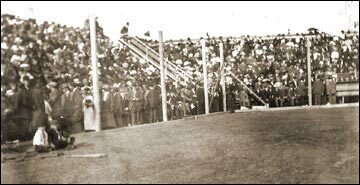 Opening day 1911 at Saskatoon (photos courtesy of David Eskenazi). Left - It appears to be a ceremonial first pitch. Right - the packed stands. 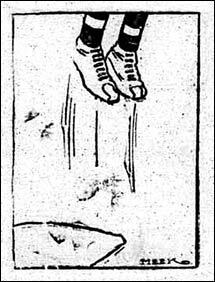 from the Calgary Herald in April, 1911. Top left caption - "Old man Moran was some class in the field.". Top right - "Morgan, on first, is some juggler on the bag." Left - "O'Brien, going after Chan's fly in the first spasm." Can't anybody get along here? 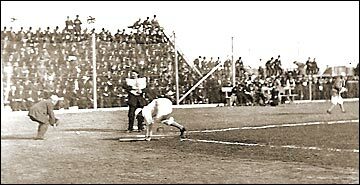 The 1911 season was filled with conflict and confusion. From his study of the summer of 1911, baseball reseacher Rich Necker has authored three pieces on various aspects of life in the Western Canada League of a hundred years ago. Pitcher Walter Ford of Edmonton is the brother of Russell Ford of the New York Americans.